~ A hillside of gorgeous Aspen and Birch with the Showy Lady Slipper (pink) and Lesser Lady Slipper (yellow) at their base. Often called Orchid of the North, these lovely flowers grow wild near our cabin at Morson in NW Ontario. 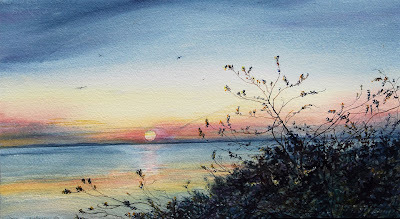 This painting incorporates several different mediums (watercolor, gold/silver acrylic, iridescent watercolor medium and archival gel pen) creating a glow and almost 3-dimensional quality. ~ My maternal grandmother, Catherine Anastasia Flynn Begley, fashioned this lovely Crazy Quilt. The powder blue ceramic vase was probably a wedding present to her when she married my grandfather, John J. Begley on Oct. 31, 1900 in Potter, KS (just outside Atchison, KS). 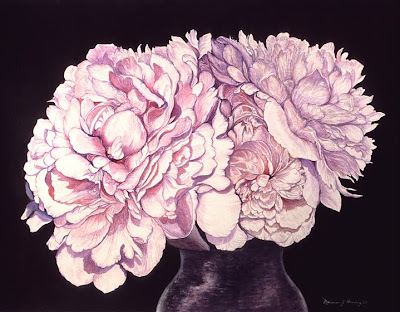 She lived with my family and always had the vase filled with fragrant peonies…these were grown by my husband Joe. 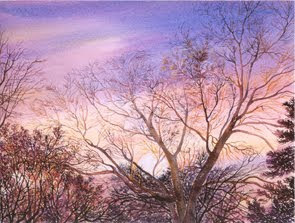 Besides sewing beautiful quilts and embroidery pieces "Katie" also did gorgeous pencil drawings. 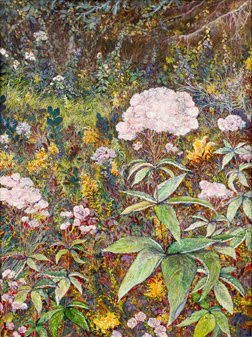 I was thrilled to discover several expertly drawn works she completed in 1898, at age 17, tucked behind a group of elegantly scripted essays in her school workbook. 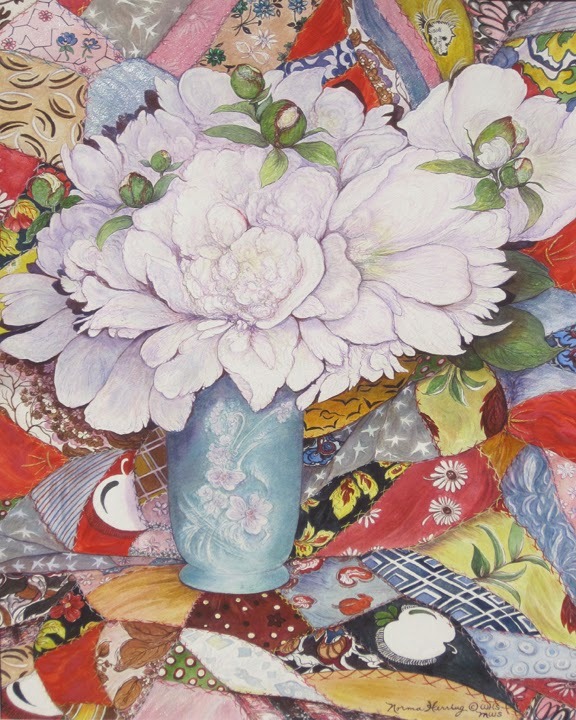 This still-life watercolor was a challenge in "textures" and is my attempt to honor my love for her and the very important part she played in my life, a grateful tribute to the artistic talents she passed on to me, my children and other family members. ~ The miniature yellow Lesser Lady Slippers growing wild at our summer home on Lake of the Woods at Morson, Ontario Canada. These tiny orchids were no bigger than the tip of my little finger. I was fascinated to learn there are 2 sizes…had no idea! 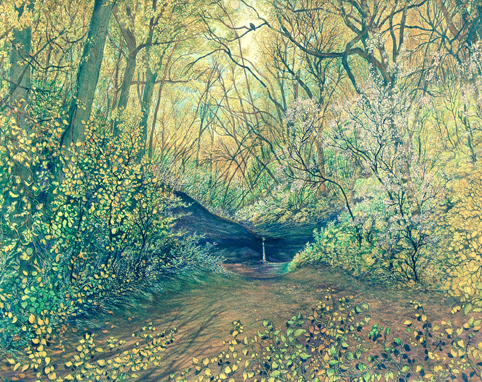 This painting took many hours over a 6 month period to paint but was well worth it since I felt I succeeded with the perspective, lighting and depth. I added a small brilliant blue damsel fly to grab the viewer's attention and touches of gold acrylic and iridescent w/c medium for whimsy and fun! ~ A closeup of the pink Showy Lady Slipper set against towering Aspen and native evergreen trees near a winding stream by our summer home on Lake of the Woods, NW Ontario. Look closely and you'll see a toenail moon peeking between the shimmering leaves at the top. Twilight is my most favorite time of the day especially when it is graced by a vibrant sunset. This area is called "sunset country"and it is very fitting! 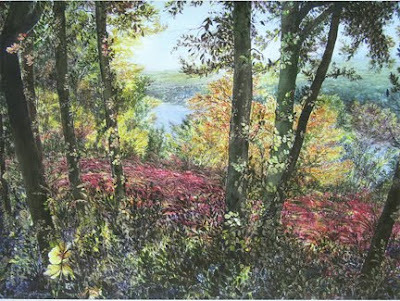 ***Recently I gave permission to the Springfield Art Museum to use my image on items they plan to sell in their Museum Gift Shop...1111 East Brookside Drive Springfield, MO 65807. Artistic Touch 5 book - $35. 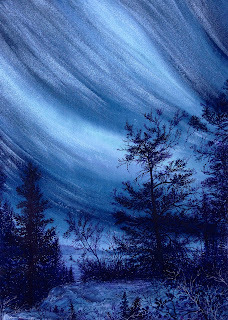 ~ Each summer we are stunned at the beauty of the Northern Lights that glow, shimmer, appear, disappear and "dance" across the night sky at our summer cabin on Lake of the Woods in NW Ontario, Canada. 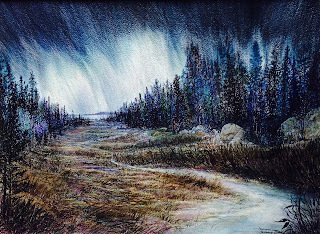 I recently reworked this entire painting adding iridescent watercolor medium to the sky, more detail to the trees and rocks, an eagle nesting in the Jack Pine tree and richer/deeper colors throughout the sky and foreground to add to the mystery of this nocturne painting. It SPARKLES with new light! 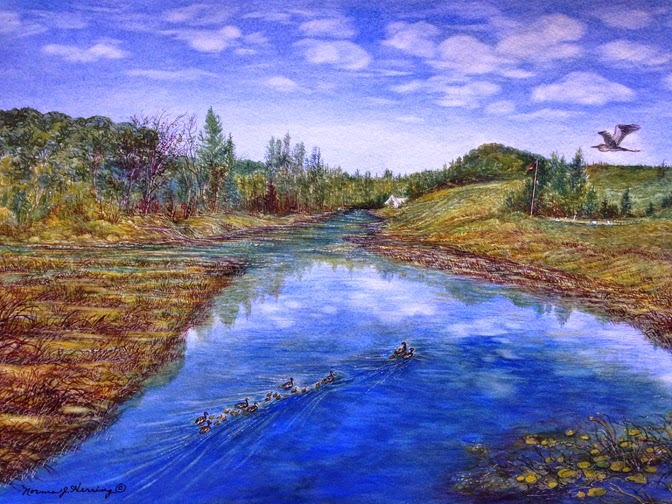 ~ This is The Little Grassy River at Bergland in NW Ontario. We pass over the bridge here on our way into Baudette, MN to get mail and groceries when we are at our summer home in Canada. Much to my delight, a huge gaggle of Canada geese passed under the bridge while I was taking photos. I imagined the heron because this area is known for its Great Heron population. The "blue" of the lake is truthful to the actual color and the puffy white clouds, golden water lilies and reflections were a sight to behold. ~This beautiful marshy area with tall cattails is along the "back way" to town near our summer home in NW Ontario, Canada on Lake of the Woods. 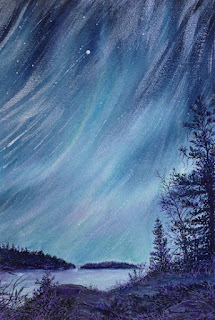 I created a dramatic aurora nocturne from memory (made even more exciting recently with the addition of metallic gel pen and iridescent watercolor medium for "added sparkle") making it one of my favorite paintings. We're lucky to see the Northern Lights often and are continually amazed and mesmerized by their magical display. ~ While on a field trip in Colorado I happened upon this giant fungus growing on a tree stump. It was the biggest "mushroom" I'd ever seen and it fascinated me. The thought immediately came to mind..."life goes on" in strange ways even after things die! 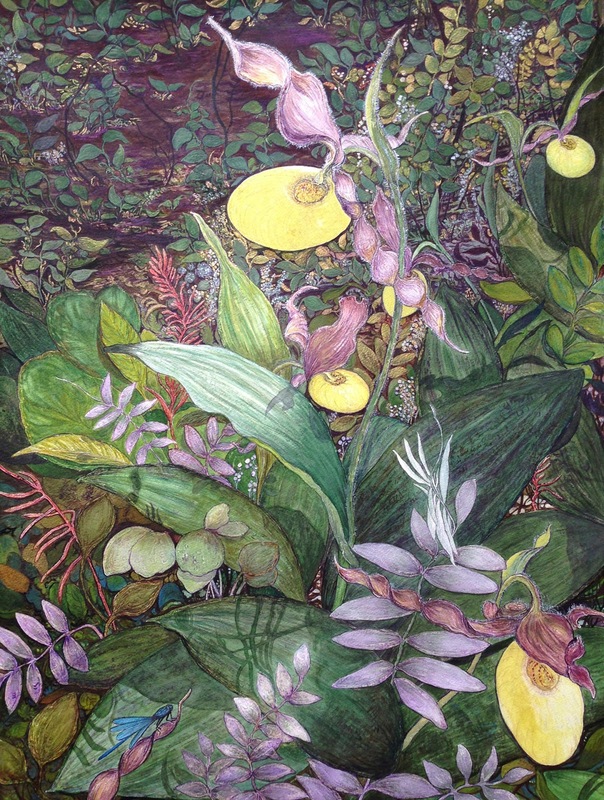 Although my painting was framed up I didn't feel the background was correct, so I took it apart and spent months adding imagined weeds, wild violets, strawberry plants and even a tiny lady bug. For a little whimsical effect I used gold acrylic and gel pen…and now I love it! Amazingly, when I took it outside to photograph it something "quite magical" happened....a bumble bee landed right on my watercolor flowers as if they were real. I take that as a great compliment! ~ I was captivated by this winding, shallow creek in the Flint Hills and imagined it being used by all sorts of wildlife as their "secret" way to travel unnoticed from one area to another. I tried to use many of the colors I noticed in the water surrounding Monet's water lilies (on view at the Nelson-Atkins Art Museum in KC) and enjoyed the many months it took to get this scene exactly the way I envisioned. This is Coyne Creek at the Flying W Ranch in Cottonwood Falls in the beautiful Flint Hills in KS. 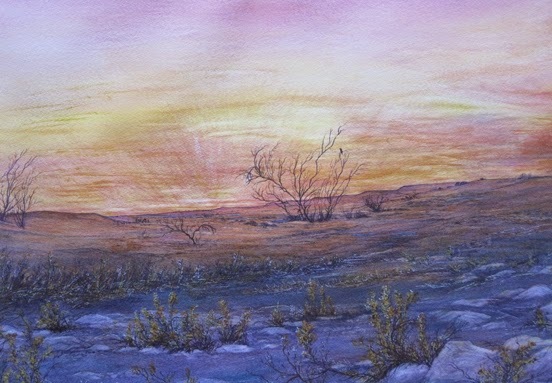 ~ This soft and peaceful scene was created from memories and impressions of the beautiful scenery I experienced during a horseback ride in October 2011 at the Flying W Ranch in Cottonwood Falls in the Flint Hills. It was purchased recently as a surprise Christmas gift for a friend of Joe's who often travels through this beautiful area that makes up the last of the tall grass prairie. 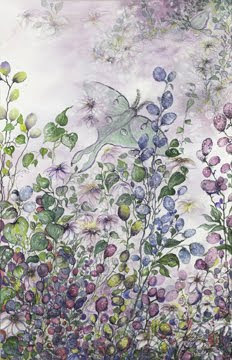 Medium - watercolor, iridescent watercolor medium and archival gel pen. 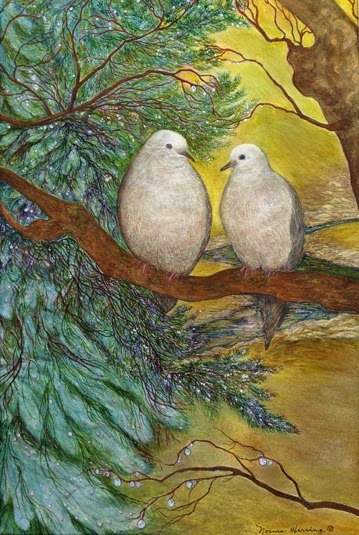 ~ These Mourning doves seemed to be gazing at each other in such a sweet way in early Spring outside our bedroom window that I was inspired to try and capture this moment between them. After a brief shower the Redbud and Blue Spruce trees were covered in water droplets as the sun came out. In researching the doves I discovered they have a beautiful light blue eye ring and bubble-gum pink toes! 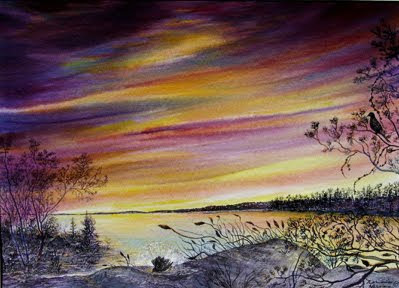 For fun I added iridescent watercolor medium and gold acrylic so the painting sparkles with life! 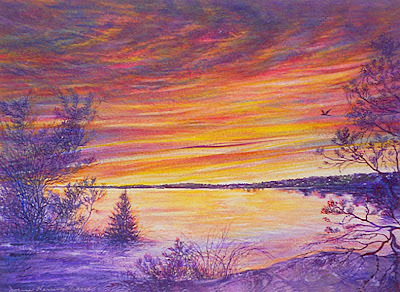 ~ From memory I recreated one of the beautiful sunsets I witnessed while a student at Mount St. Scholastica College (majoring in Dietetics). The Mount in Atchison, KS sets "high on a hill" and that phrase was also part of many songs we sang. Now the Mount is part of Benedictine College so I included several Ravens since they are St. Ben's mascot. ~ While horse back riding at the Flying W Ranch at Cottonwood Creek in the Flint Hills, this intriguing creek bed with the gnarled trees, ancient rocks and a big mud puddle all "spoke" to me. I decided to create a "vignette" of the nearby hills from that perspective, complete with a grazing deer, in an attempt to capture the awe-inspiring grandeur we experienced over and over that day! ~ It all began innocently enough with a simple sketch of a branch from a wild cherry tree. 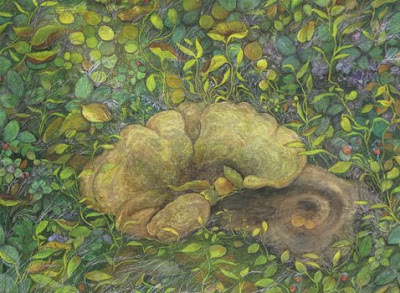 But quickly this painting took on a life of its own for several years until it evolved into its final, fantasy-like composition. The crowning touch was painting a little Ruby-throated hummer at the top, one of many we enjoy feeding at our cabin in Canada. 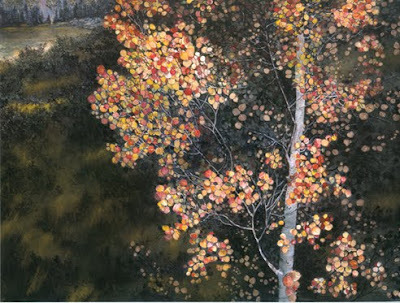 ~ A favorite photo from 1984 of sunlight hitting a single, glorious branch of a Colorado Aspen tree inspired this painting. 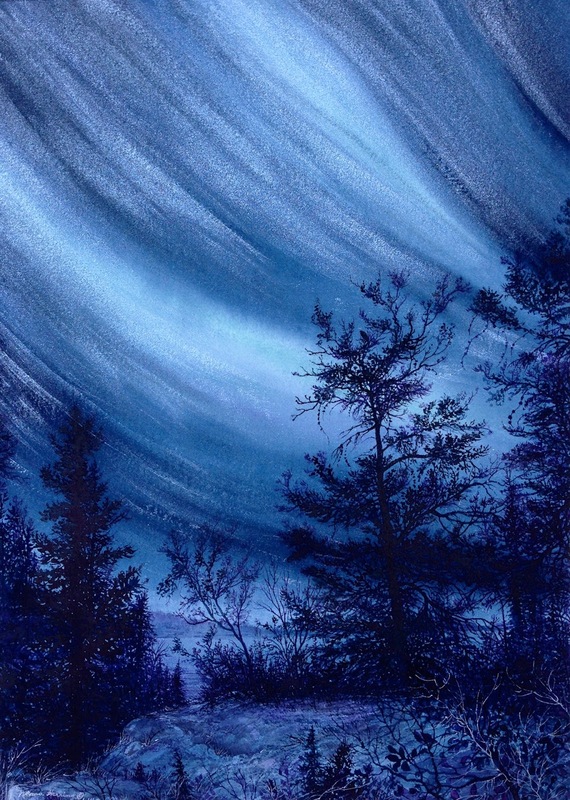 Some 20 years later, after many struggles, this painting was "born." My first-ever mixed media work! Winner of several awards and published in several magazines. ~ Every color of the rainbow presents itself in this spectacular view of the Missouri River near Weston. As you can see, the bright reddish pink sumac were truly GLORIOUS! And, of course, the scene would not be complete without the noisy midwest grackles. ~ The Joe Pye "weed" that grows wild along the highway in NW Ontario, Canada near our summer home...and right here in Kansas also! It is related to the crysanthemum and changes from pale pink to fushia when it blooms. 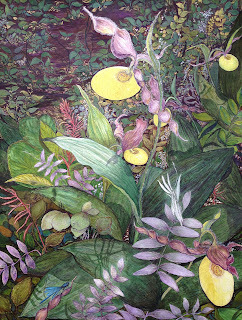 This richly detailed painting took six months to complete and all the enjoyable time it took reminded me of doing embroidery years ago with my Grandmother...Catherine Anastasia (Flynn) Begley from Potter, KS near Atchison who was quite an artist herself. ~ In August 2015 we experienced "something incredibly amazing" at our cabin on Lake of the Woods in Canada….the Aurora Borealis, Perseid meteor shower AND the International Space Station (ISS) passing directly over our cabin with astronaut Scott Kelly inside….ALL in the same night! This 16x11 in. 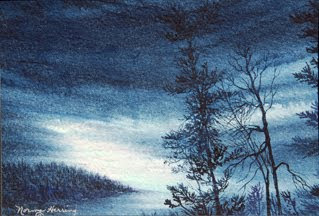 mixed water media painting is available as full-size "Enhanced" Giclee Prints and Notecards. 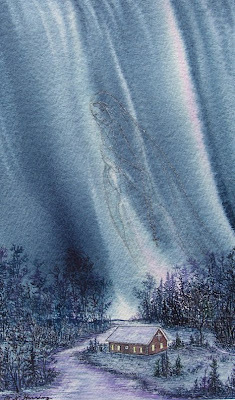 An *enhanced print* has small amounts of hand drawn detail on top of the archival print. ~ While watering the garden, imagine our surprise to find a ruby-throated hummingbird taking a bath in one of the leaves of our giant rhubarb plant. I froze and didn't even blink while I memorized this most unusual scene. 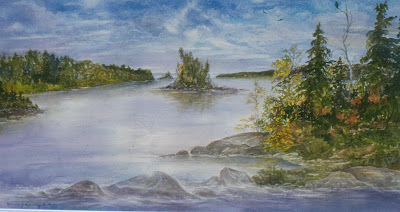 ~A favorite fishing spot on Lake of the Woods near our cabin. We experience brilliant sunsets and love watching birds as they bathe in the rock crevices. The large crow in the tree is waiting his turn. 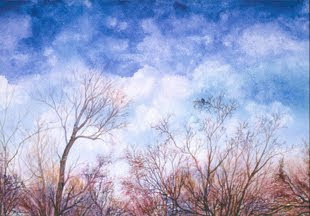 "September Mourn ~ Tribute to 9/11/2001"
~ That fateful morning of 9/11 is forever etched in my memory. 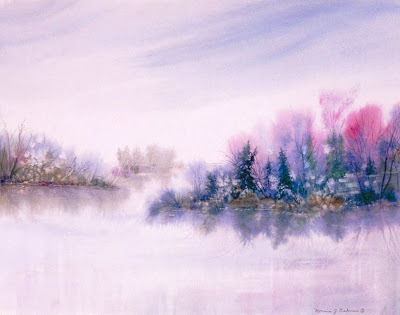 It moved me to create a painting in honor of those who died. This a very personal painting...the "rose" is for all who perished...the "tears" are for those of us left to mourn...and the NY skyline, with the two shafts of light pointing toward the heavens, reminds us we'll meet them again someday. "Feathered Friends of the North"
~Almost all our bird friends are pictured in this quiet cove near Burrow Bay: a Loon family, pelican, mallard ducks, eagles, cormorants (merely dots on the horizon) and a blue heron. ~ Just another Tequila Sunset (not Sunrise)! Looking toward Port Isabelle from South Padre Island on the Laguna Madre side. The osprey reminded me of the bald eagles we see up north. And the song by The Eagles was inspiration for the title. 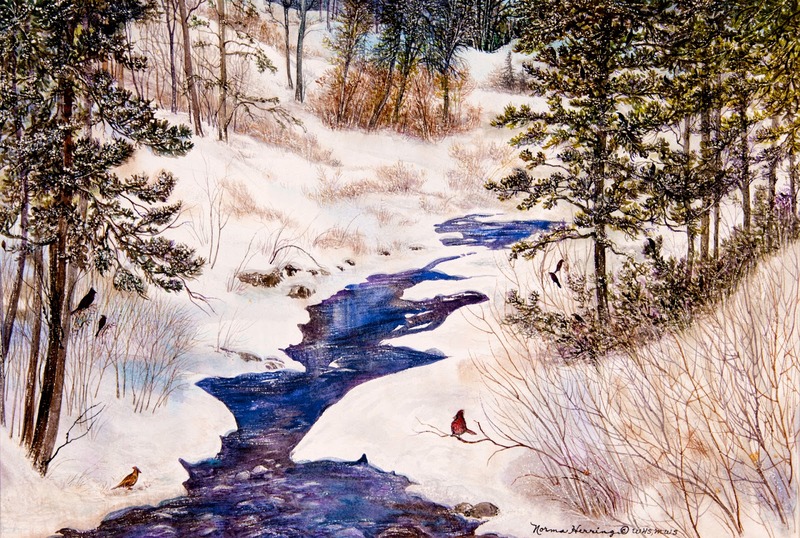 ~A photo taken on a ski trip in Colorado inspired this winter painting. 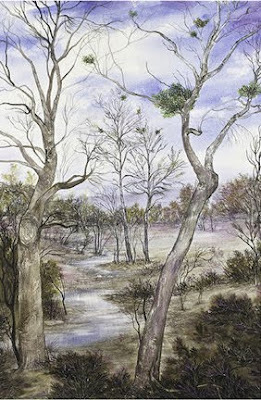 It was a joy to paint and took me back in time to that beautiful area. Look hard and you'll find a few birds scrounging for their dinner including some gorgeous red cardinals! 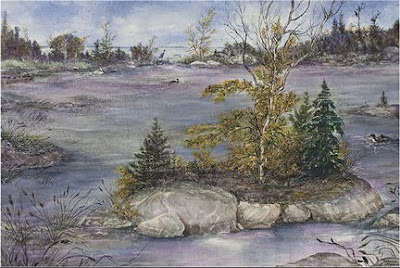 "Autumn Finale ~ Miles Bay"
~ From memory I painted one of our favorite fishing spots near Miles Bay in Canada. As usual, bald eagles nest here, and it is also a popular site for "shore lunch." While the eaglet in the tree screaches at its parents to bring some dinner, we concentrate on catching walleye for ours. ~My favorite rose....a gorgeous, soft peach color. I love to paint long stemmed roses in a wide variety of colors as commissions to fit various decor. They are especially nice for wedding and anniversary gifts. 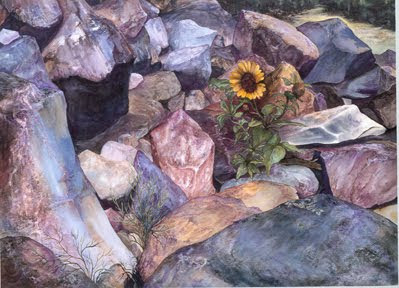 ~I admired this sunflower's survival amid the boulders at a Colorado reservoir. The real rocks were somewhat ordinary but with artistic license I was able bring out their marble-like beauty. Winner of several awards and published in KC Voices 2007. 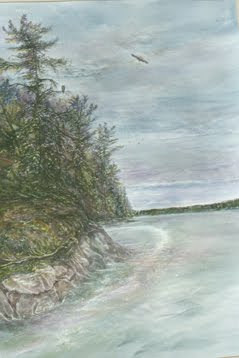 ~Fishing near this island, we were "buzzed" by two bald eagles who call this island their home. The ring of foam washing in is natural, coming and going all summer. ~Done as a gift to my husband before we were married. Strangely, it looked exactly like his backyard tree line, even though I had never seen it. Is that weird? 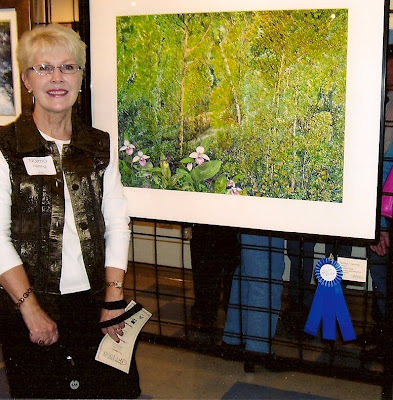 It's a Blue Ribbon award winner and was published in 2010 KC Voices Art/Literary magazine! 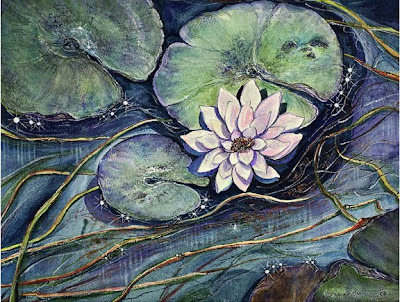 ~A lovely water lily floating among sparkles of bright sunlight hitting the water. I actually picked this one and marveled at the stem which had to be 12 ft. long. 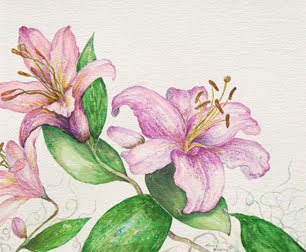 ~ Lush Oriental lilies "redolent" with their incredible, unique scent in our garden in Canada almost begged to be painted. 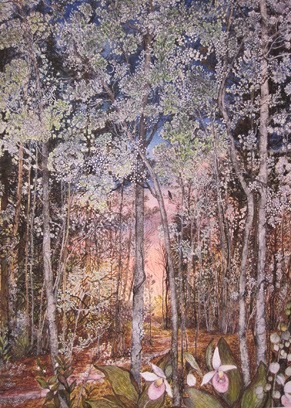 But, it took several years and a metamorphosis before this painting could be considered finished. 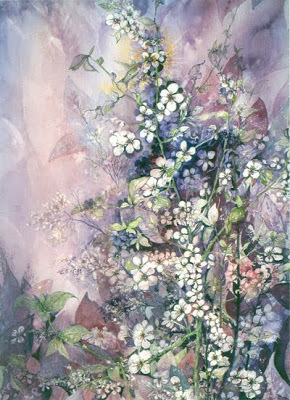 Ultimately….a square table became round, a glass turned into several different shapes of a vase (including this final version embellished with gold acrylic), extra greenery was added with additional baby's breath highlighted with iridescent medium, and the overall color was intensified so the painting almost glows. 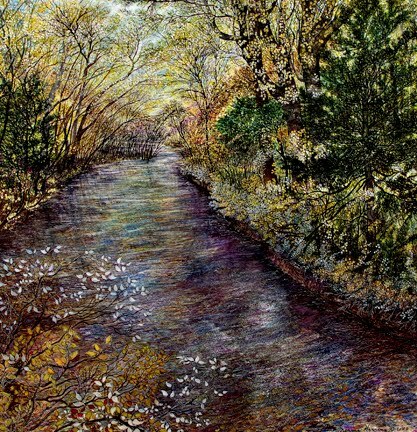 It is dramatically matted and framed in black which makes it quite stunning! 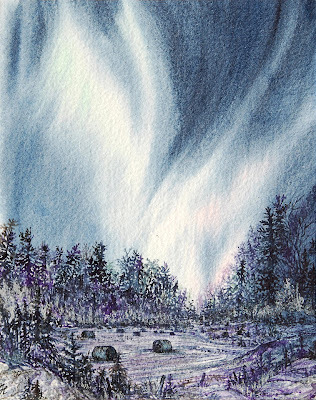 "Distant Glow of the Aurora"
~In this very small watercolor (post card size) I was able to capture the distant glow of a beginning aurora display looking NW from our cabin on Lake of the Woods in Canada. Often there's an eerie green glow to the shafts of light that appear/disappear all night long (or until we can't stay awake to watch any longer). ~A gorgeous life-size luna moth "on a mission" to hopefully find a mate (see her in the top right corner?). This rare moth remained on our window screen for 2 whole days....what a treat! Most people never get to see one of these creatures during their entire life so we feel quite fortunate. Honored with a full-page reproduction in 2010 KC Voices magazine. ~Carl and Virginia Herring commissioned this painting when they moved into Claridge Court in OP, KS. Her granddaughters called Virginia "Mina". This painting "lives" in Carl's beautiful apartment above his couch. ~ Some of the prettiest sunsets take place right here in Kansas. 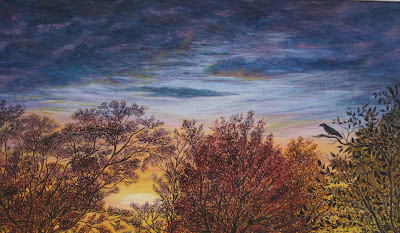 As I painted this, looking west from our patio, the song title came to mind. ~ Oriental lilies happily growing in our garden at Lake of the Woods. All the flowers seem to love the soil up north...reaching heights that are amazing. ~These larger than life peonies were saved just before a huge downpour. I loved the abstract pattern of the leaves and decided to paint them in the manner of Georgia O'Keefe. 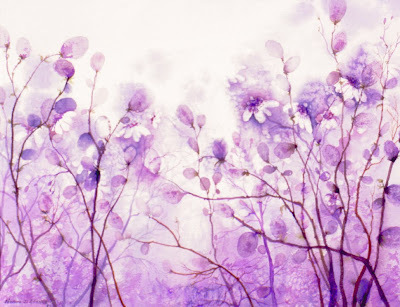 The dark background is 10-plus layers of watercolor glazed over each other to get the burgundy color. "Our Lady of the Lake Aurora"
~The Blessed Virgin is watching over our little Catholic church in Morson, Ontario...Our Lady of the Lake parish. A commissioned gift to our special pastor, Fr. Dan. 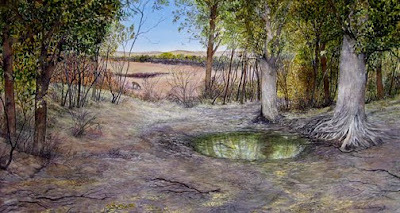 I had the idea of this painting for several years. It took many tries until I had just the right "aurora" sky that would fit her image. 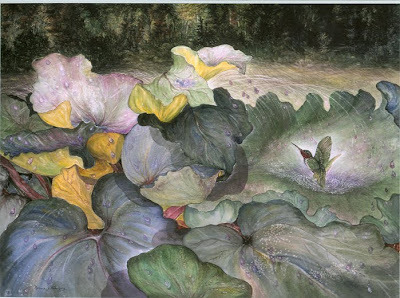 ~This was a study done for my larger water lily painting. 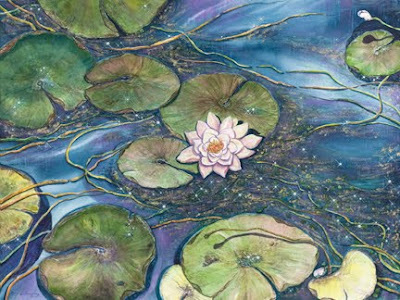 I worked out the colors and how to approach the lily pads...also how to indicate the sparkles of sunlight bouncing off the water and weeds, etc. I love the way this little one turned out. 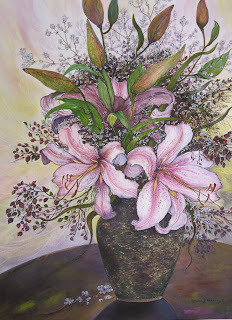 Undeniably Monet did the best lilies...but mine are certainly unique! 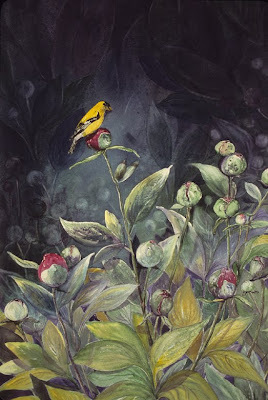 ~Early one morning while having coffee out on the deck in Canada, I was delighted to watch a tiny goldfinch land on one of the large red peony buds just about to burst open. He seemed to enjoy his soft perch and it came to me "this" was a scene I'd love to paint. 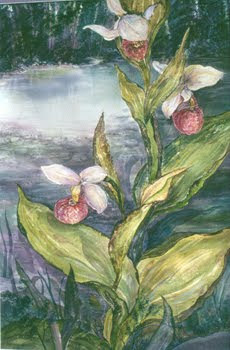 ~The Showy Lady Slipper is the Minnesota state flower. It grows wild near our cabin in Canada, much to our delight. Related to an orchid, it is found in watery areas near Aspen and Birch groves. It blooms yellow as well as pink. 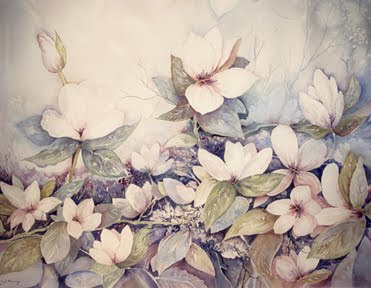 ~A little salt sprinkled on this watercolor during what's called the wet-in-wet stage helped daisies appear unexpectedly! 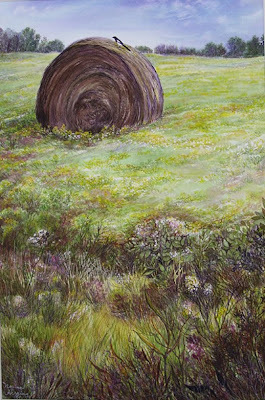 The little puffballs are a favorite subject matter that I paint often from memory. ~A glorious sunset on Lake of the Woods in NW Ontario with a blue heron heading out for a little evening fishing. This was a commission for a friend and hangs in his office in Tama, IA. ~ How fascinating to discover the clumps high up in the trees near Parsons, KS are something other than a squirrel nest. This fungus stays "evergreen." 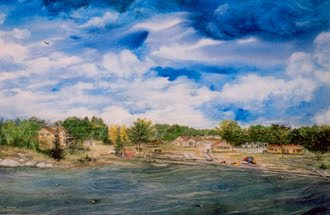 ~This is Mylie's Place Resort at the end of the cove by our cabin in beautiful Morson, Ontario. It is a wonderful fishing camp with cheerful yellow cabins. This was a commission and I had great fun painting it! It even has Justin's favorite John Deere tractor ready for action. ~ A commission of Joe/Jane Welle's summer home and beloved Grady White boat on beautiful Lake of the Woods. It was given to Joe by his family for his Nov. 1, 2011 birthday. 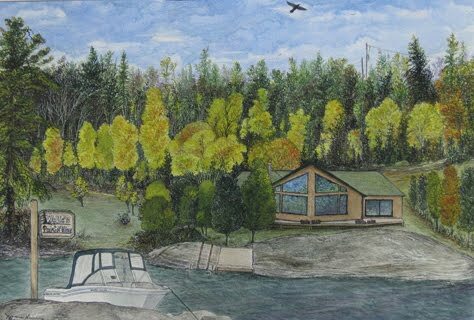 Joe and Jane had this wonderful summer home built by Terry Olson several years ago and their children and grandchildren love spending as much time as possible enjoying all that this gorgeous area in Canada has to offer. With the help of "artistic license" I created an island in front of their property to feature their unique sign. "Northern Lights and Hay Bales"
~A Canadian farm field takes on a silvery beauty beneath one giant beam of the Northern Lights.